To get a better idea of what actual shoppers experience when browsing and buying on Amazon, I’ve asked one to take a little shopping trip. Meet “J” a health-conscious mother of three (and closet chocoholic) who agreed to document her every move and thought while in search of a bread/loaf pan. Here’s her enlightening journey. The first one that pulled up was the Wilton Perfect Results. It looked nice and long, but the second one caught my attention for some reason. The picture is taken at a unique angle, so maybe that was it? I also noticed it had over 400, 4-star reviews while the first pan had less than 20. I clicked on the more popular one first, but the bullets and description weren’t impressive. It basically just told me the dimensions. It didn’t include any features, benefits, or uses, so I didn’t stay on that page long. I went back to that first pan and noticed the highlighted “Product Features” right there on the search results page. “Bake big batches” told me this pan was made specifically for what I’ll be doing. After double-checking the dimensions, I added this pan to my list to review later. Returning to the search results, I saw a 2-pack of pans, but they looked very short. I think it was just a bad angle with the pictures, but they looked tiny. I was about to scroll past until I saw that they had a 5-star rating with over 250 reviews. It got me thinking that maybe I should get 2 pans. That way, I could go longer in between baking days. With this in mind, I clicked on it but quickly saw the dimensions were too small for what I was wanting. Back to the search, I found a silicone pan. I never thought about silicone, and frankly, didn’t even know they made those. While curious about the benefits of silicone, the bright color is what made me click. However, its dimensions were even smaller (10 in), so I quickly passed. Continuing the search, I came across one that had little grooves along the pan’s interior. Having never seen that before, curiosity once again got the better of me. I clicked on it, primarily, to see what those grooves were used for. The bullets and description didn’t provide any explanation. The whole reason I clicked was to learn about those dimples, and they didn’t even mention them. Were they for cooking evenly? Easier release? Texture? Had they explained their purpose and/or benefit, I may have considered this pan. Returning to the search results, a colorful, turquoise pan caught my eye. The bullets have more substance to them than previous listings, which was appreciated. It’s apparently freezer-safe, which would come in handy. I was interested until I got to the description. It goes on and on about cakes, muffins, and cupcakes but doesn’t mention plain ole sandwich bread. 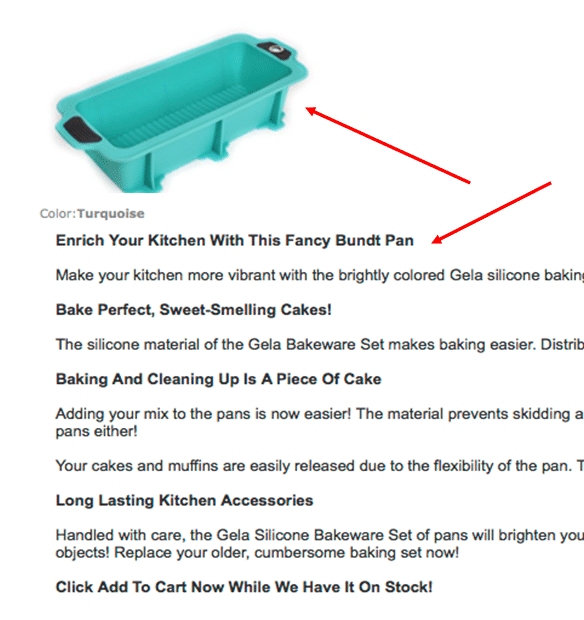 It even calls it a “bundt pan.” Pretty sure I’ve never seen a bundt pan in the shape of a loaf. Why ramble about desserts? Highlighting its versatility is one thing, but at this point, I’m just confused about its primary purpose. Moving on. The first one that caught my eye says “commercial” in the title. I’m wanting to bake bread just like they sell in store, so buying a commercial pan makes sense. Unfortunately, the last bullet threw me off. Maybe it’s just me, but this wording makes the pan seem high-maintenance. I have 3 kids, a house and a business to run. I just want to throw it in the dishwasher and move on with my day. After scrolling past a few non-relevant pans and some overpriced ones, I saw a silicone pan that looked nice and long. The title was annoyingly stuffed with every keyword you can imagine. Still, I clicked on it and noticed lots of pictures. I don’t like buying things with just 1 picture, so I appreciated the multiple angles and views these provided. They even had an image with a ruler to show the pan’s size. That was nice. I read through the bullets and saw that everything was listed in centimeters and liters. Seeing the dimensions in inches would’ve been better. I scrolled back up to look at the pictures and noticed they had zero reviews. That was a red flag for me, so I moved on. 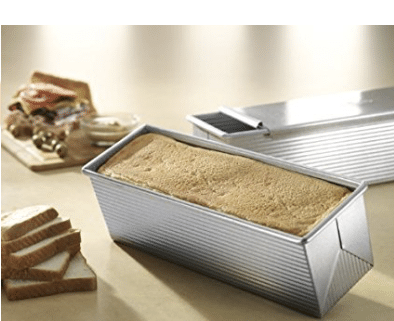 Back to the search results, I clicked on a long, square loaf pan with a lid. I almost always look at the pictures first, and I’m glad I did with this one. It has an image with the bread in the pan and a pile of slices next to it. Exactly what I’m looking for. I noticed the reviews next. They have a 5-star rating with over 900 reviews. Impressive! The bullets were well-written and informative. The only downside was its size. It was a 13 inch, and I had previously been looking for a 16-inch pan. However, it looked long enough, so I went and measured one of our store-bought loaves and found it was 13 x 4 inches – the exact measurements of this pan. I read the description, which explained the purpose of the lid in creating perfectly shaped sandwich bread. The line about peanut butter and jelly sandwiches sold me. The whole reason I’m looking for a bread pan is to make healthy bread for my kids, who just happen to devour PB&Js like they’re going out of style. I scrolled back up and added to cart. I’m pretty sold on this pan, but I always like to look and make sure it’s not being sold cheaper by another seller. I saw one that looked just like the previous pan but was $3 cheaper. I was about to click on it but then noticed the “Product Features” snippet. It says “Made in China” whereas the other is American made. After seeing that, I didn’t even click on it. I’d rather pay $3 more for something made in the USA. All the other reviews said the same thing. After seeing the perfectly square results of the other pan, I’m convinced I need a lid, so this pan wasn’t an option. 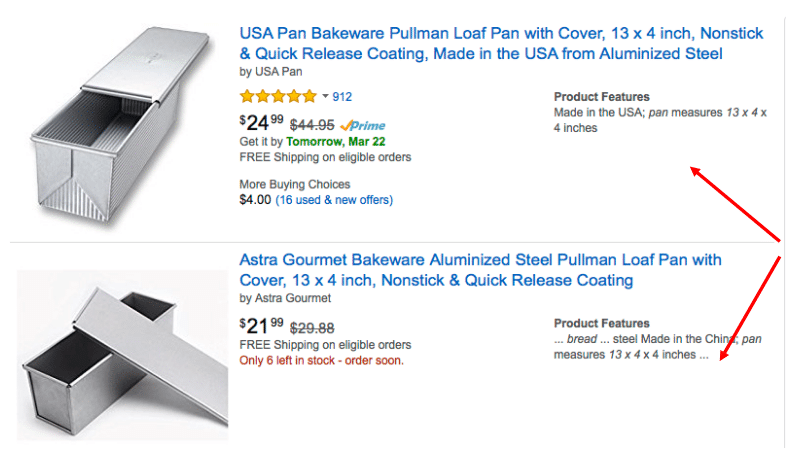 Before sealing the deal on that USA Pullman Pan, I did one last, broad search for “13 x 4 pan” to make sure I wasn’t missing anything in that size range. I don’t usually go past the third page of results, so when I hit page 3 and still wasn’t finding anything, I ended my search. I clicked back over to the USA pan and read some reviews before making my final decision. They were overwhelmingly positive, and dozens of them included pictures of beautiful, just-like-the-store loaves. At this point, I purchased with confidence and am looking forward to our house smelling of fresh-baked bread! This article was helpful! Thanks Karon! 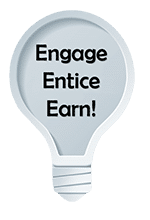 I’m interested in exploring the mindset of the modern consumer that gets more emotional rewards from ordering online than in brick and mortar. What is the reward to belonging to the exclusive club of “Prime” and the loyalty that comes with it. I don’t know about emotional rewards. For me, Amazon Prime membership is about convenience and saving money. I order so much from Amazon that I would pay way more than $99/year in shipping costs. I suppose some emotional rewards could include satisfaction with getting your items in 2 days, happiness that you saved money and pride in a job well done! 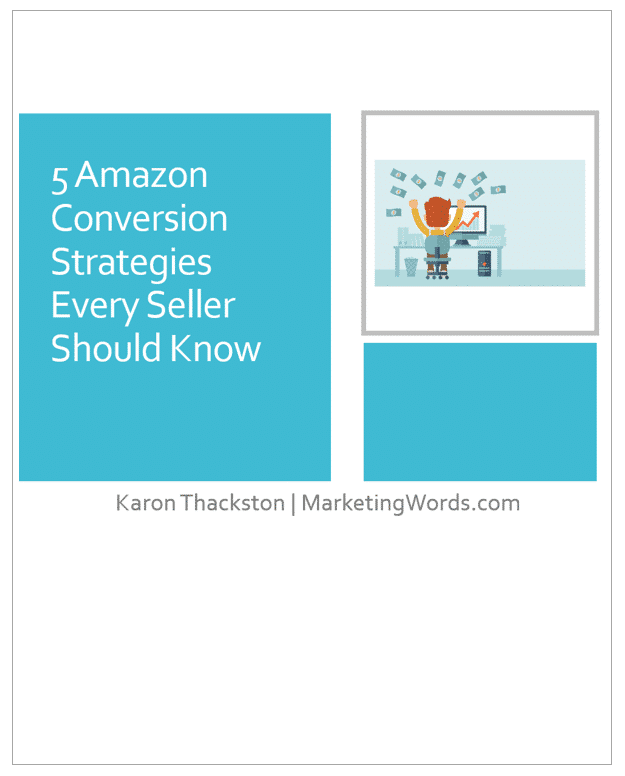 Great story and very helpful. Thanks Karon! Thanks! 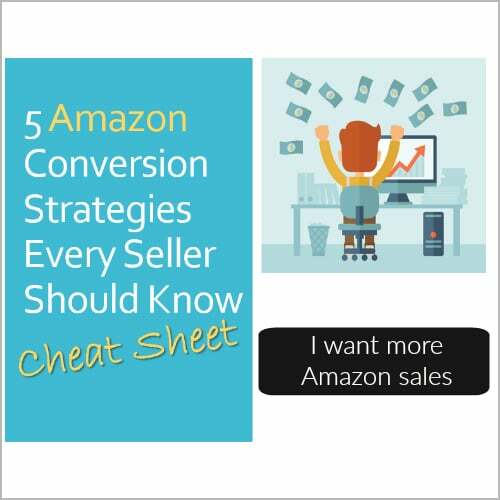 Hope it helps you make more sales. I feel much better about my shopping habits after reading how much we are alike in this! 🙂 Thanks for sharing, Karon! This is from a woman who wanted to remain anonymous. Her first name starts with “J.” It is her shopping experience which I think a lot of people share. Glad you found it helpful.